Inside and out, a cardboard box offers the opportunity to print on 12 different sides. Printed packaging can be used to brand your boxes, provide product information and send messages to your customers. Customers are seeking a personalised shopping experience and packaging plays an essential role in delivering exactly what they are looking for. With a range of printed packaging options, there’s simply no reason to send plain, beige delivery boxes. The outer edges of a cardboard box are a blank canvas. They are brought to life with simple print design, or vibrant, multi-coloured patterns. A bold, colourful printed box adds to the excitement of revealing what’s inside, so it’s time to get creative. In addition to the design, the exterior of a box can be printed with handling information, barcodes and other data to support efficiency and safety. A touch of metallic gloss? From flexographic print to spot varnishes and foil blocking, cardboard can be printed in an extensive variety of colours and finishes. 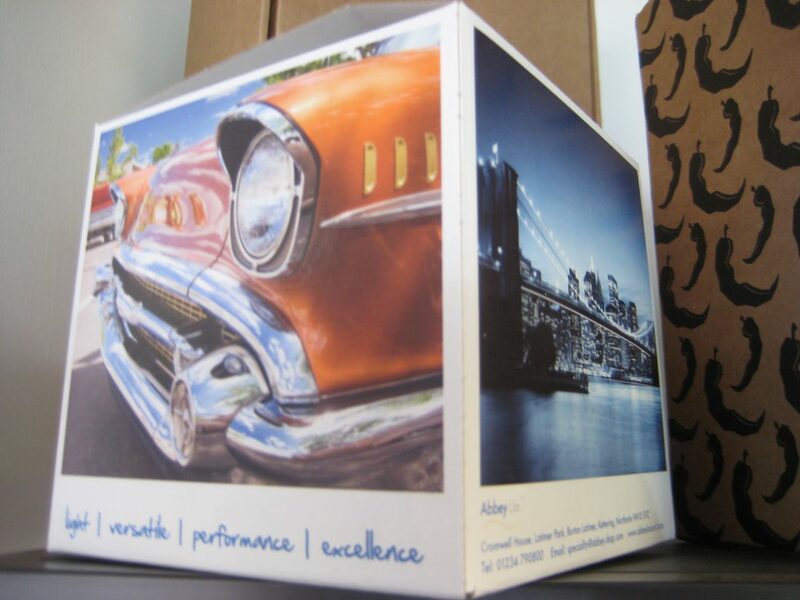 Flexographic print is a very low-cost option that can be used to great effect on cardboard. At the other end of the spectrum, cardboard can be printed with superior quality photographic images. This can be an effective option for smaller print runs. Photographic images aren’t widely used in product packaging, so they can really grab attention at product launches or with limited edition ranges. Can you increase the value of your goods by paying attention to the details? Simply flood printing the internal walls of your packaging box has been shown to boost perceptions. A 2017 study run by Celloglas and the Retail Institute showed that the value of goods placed in boxes with flood printed interiors was thought to be higher than those in unprinted box interiors. Internal printing can also be effective for boosting customer engagement. Add a friendly message, a hashtag request or a loyalty discount code to the inside of your delivery box. You might even use the box interior to support customer service. Assembly instructions, care advice or ideas on how the product can be used, are all means of adding value. Alternatively, why not have a bit of fun and print a template on the inside of your packaging? Corrugated cardboard is sufficiently strong to be used for a variety of cut out and assemble design ideas. What would be relevant to your product range? Cardboard inserts enhance presentation, as well as preserving the position of goods in a box. If your packaging includes cardboard inserts, these can be printed to match the interior, or in a contrasting colour that really stands out. Aylesbury Box Company offers expertise in design and print. If you have the ideal image, we will advise on the format and layout to make. If you are looking for printed cardboard packaging, get in touch and we’ll help you to make your ideas a reality: 01296 436888.